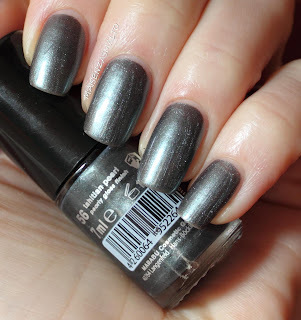 Here the weather is cold again so today's "winter" polish is quite appropriate: this is a Fairwind polish from Silk Collection (there are still few pieces available in Schlecker stores here); I think inspiration for this polish is Chanel Black Pearl, as it's a frost grey/green (with all related issues, as visible brush strokes), even if the Chanel, for what I recall from the bottle I saw, has visible green shimmer, that this one is missing. It's quite sheer after first coat, but opaque enough after second one. I usually loathe (thanks to Madonna I learnt a new English term) this finish but I like the shade, so I'm on the fence about this one. You? In tema con in freddo, che proprio non se ne vuole andare, oggi posto uno degli smaltini Fairwind della collezione invernale Silk (si trovano ancora nelle drogherie Schlecker), secondo me fortemente ispirato allo Chanel Black Pearl (che però, dalla bottiglia che ho visto, mi pare abbia in più dello shimmer verde): è un verde grigio perlato -quindi segni delle pennellate come se piovesse- chiaro dopo la prima passata e coprente dopo la seconda. Non amo questo finish ma il colore non mi dispiace, quindi su questo smalto mi sento “in bilico”...Voi?